enjoy this spectacular area. In fact... plan to arrive early! The months of April, May and June offer the B&B guest many incredible vacation opportunities. 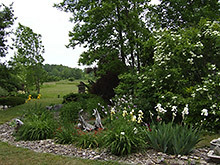 The Grey-Bruce B&B Association, www.bbgreybruce.com, covers a huge part of South Western Ontario. From Walkerton to Wiarton, Port Elgin to Kimberley, you’re invited to spend time in some of the most beautiful country, and in some of the most beautiful homes, Canada has to offer! Grey and Bruce Counties are bounded by water, with Lake Huron to the west and Georgian Bay to the east. 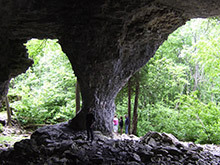 The Niagara Escarpment, a World Biosphere Reserve, runs virtually up through the middle. Throughout spring and early summer the outdoor enthusiast will find many opportunities to stretch those “winter weary” muscles. 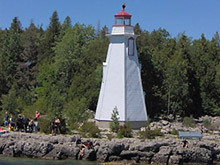 Why not catch a maple syrup festival, hike the famous Bruce Trail, cycle along our quiet back roads, visit over thirty rural gardens, or discover any number of local waterfalls and lighthouses. 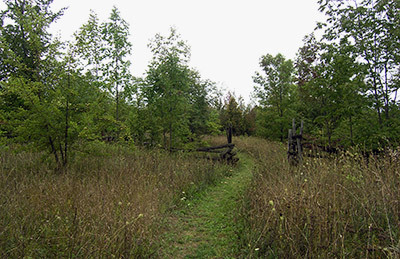 Many visitors come in search of rare wildflowers and spring foliage (Bruce Peninsula Orchid Festival), www.ruralgardens.ca, the elusive bird (Huron Fringe Birding Festival), fishing, painting or photography opportunities. You might want to attend the Annual Rocklyn Classic Car Show or the South Bruce Vintage Tractor Tour. 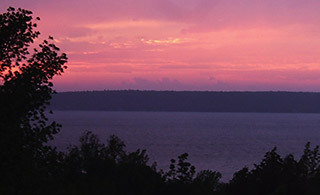 Others find that the Grey-Bruce region is the perfect place to hold conferences, getaways, workshops and retreats. If golf is your passion, you’ll be thrilled with what Grey-Bruce has to offer. In just three years, six new golf courses, including Cobble Beach Golf Links, Ontario’s Best New Course in 2007, have opened in the area. That means Grey-Bruce now has 34 golf courses, www.greybrucegolf.com, to go along with its many other amazing attractions. Perhaps a stroll along an interesting street, a little shopping, or a visit to a local museum, gallery or cultural centre is more to your liking. You might want to visit some of the picturesque historic towns in our area. With the arrival of spring local Farmers’ Markets are also beginning to open up again. Enjoy some of this region’s best, locally grown meats, grains, fruits and vegetables. Make a quick visit to one of our Tourist Information Centres and you’ll be all set! While in the Grey-Bruce area you have the opportunity to stay in many different types and styles of B&B’s, from a gracious Victorian home within walking distance of downtown, to a newer home designed specifically as a B&B. Perhaps you’d like a view of the water from a comfortable deck chair or a stay in a century-old farm home out in the countryside. Whatever your preference, you’re sure to find it in Grey-Bruce, offered by exceptionally caring and friendly hosts dedicated to providing you with the highest standard of accommodation found anywhere. 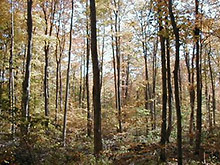 Let us show you what the Grey-Bruce region has to offer. We’re certain you’ll be back again and again!